A helping hand -- The founder and chief executive officer (CEO) of BRAVE, Meaghan Davis helping build a school with Noemi and other mem- bers of the community. This picture was taken the summer of 2017 when the BRAVE organization traveled to the Dominican Republic. In the summer of 2018, the non-profit organization BRAVE had the Founder and Chief Executive Officer (CEO), Meaghan Davis, travel to a small community called Imbert located in the Dominican Republic. “We have had the BRAVE club for three years now, which promotes the education of girls around the world and inspires others to be self-empowered contributors to the world. Every year to achieve their mission, Davis travels with girls from the organization to go on a service trip. 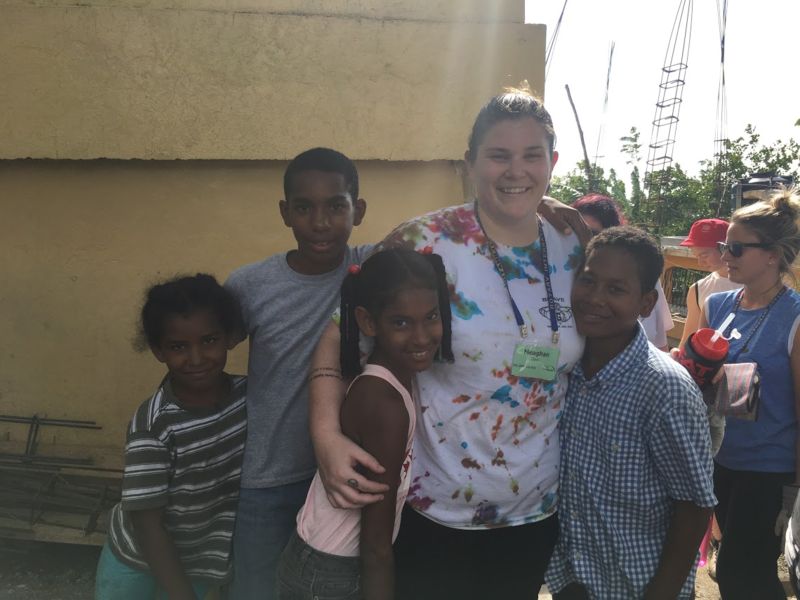 And last year, they went to the Dominican Republic to help build a school,” BRAVE advisor Meg Monaghan said. The surrounding community and members of BRAVE were all working together to build the school, which not only helped the building process but also bonded the overall community. One of the civilians that came around every day to help assist in construction was 10-year-old Noemi, and due to Davis being at the worksite every day, they began creating a friendship. find each other and get back to work again, always with a smile and many laughs,” Davis said. While they bonded, Noemi explained to Davis that she had not been in school for two years because she had to drop out due to financial issues. After getting to know Noemi and seeing her current situation, Davis thought to use her position in BRAVE and specifically chose Noemi to send back to school. BRAVE is able to achieve their goals of sending girls to school through fundraisers such as the Coin Drive. This year, the Coin Drive started on Monday, April 23, and ended on the following Monday, April 30. “The members of BRAVE asked several teachers around the school building to advocate for the cause. They were each given a coin jar which students would contribute to,” junior BRAVE member Michelle Ni said. “This year is actually the first year that we directly sponsored someone, and we were very excited to help Noemi receive the education she deserves. BRAVE thanks everyone who participated in the Coin Drive this year for such a wonderful turnout” senior BRAVE co-president Esther Ye said. This year’s Coin Drive raised $960, with the winners being the Science Department headed by Tiffany Scharpf and Virginia Toepfer raising close to $400. The winners were able to wear a cape and crown for a day. This money allows Noemi to go to school and receive needed supplies and clothing. The money will be given to Davis by check, and in this upcoming summer, her and other volunteers will go back to the Dominican Republic to give Noemi the check, sending her back to school.